The finish has always been what makes the UFC, and the sport of MMA, so exciting. Knockouts and submissions can occur at any time from a myriad of positions, with each one as unique a snowflake as the last. Some are a slow burn, others are a sudden impact. They can leave an entire enthralled audience speechless or screaming. Last Saturday at UFC 196, Nate Diaz forced Conor McGregor to tap by rear naked choke in the night’s absolutely mesmerizing main event. The stoppage was Diaz’s 11th inside the Octagon, which tied him with many of the promotion’s other greatest finishers. Here are the best of the best. This is going to sound unbelievable, but it is a 100% true fact: Vitor Belfort has been knocking people out inside the Octagon for 18 and a half years. “The Phenom” punched out Tank Abbott and he kicked out the current UFC middleweight champion Luke Rockhold. Sure, Belfort snuck a rear naked choke in there against Anthony “Rumble” Johnson a few years ago, but the UFC 12 Heavyweight tournament winner and the former UFC light heavyweight champion has 13 striking stoppages in that Octagon. It’s like Belfort is incapable of winning in the Octagon by decision because all his wins are by finish, including his head kick KO of Dan Henderson last November. Maybe even more mind-boggling than Belfort’s ability to score knockouts across three UFC weight classes over almost twenty years is that he only has one win/finish that hasn’t occurred in the first round - his second-round head kick KO of Michael Bisping. The longest win streak in UFC history was, even more impressively, almost all finishes. Starting at Ultimate Fight Night 5, Anderson “The Spider” Silva kicked off a 16-fight win streak inside the Octagon that featured 14 stoppages - 10 KOs, 4 subs. The longest reigning champion in company history delivered highlight reel endings in two different divisions, showing just what could be done in the sport. Silva’s use of knees in the clinch to defeat Rich Franklin for the UFC middleweight belt at UFC 64, his caught kick into a one-punch KO of James Irvin, his master class against Forrest Griffin, the front-kick to the face of Belfort and The Spider’s fifth round triangle-armbar of Chael Sonnen at UFC 117 are just some of the moments from Silva’s career that brought fight fans to their feet and left an indelible impression on them. With much of the sport’s rise in popularity starting at the tail end of his reign, there’s a sad reality that a lot of fight fans did not experience the dominance of UFC Hall of Famer Matt Hughes first hand. A quick comparison - the man who successfully defended the UFC welterweight title seven times over two reigns was a lot like his heir apparent Georges St-Pierre, except Hughes finished guys. A lot of them. Hughes made his Octagon debut in 1999 and retired 12 years later, but the former two-time NCAA Division I All-American wrestler presided over the 170-pound division from 2001 to 2006 via submission and ground-and-pound. All told, Hughes scored eight KO/TKOs and secured five subs with more than half of those finishes (8) occurring in UFC title fights. It’s one thing to read or have been told how great the star of Miletich Fighting Systems was, but Hughes’ 12-1 streak from UFC 34 to UFC 63 was truly incredible and something every fight fan should see to believe. Most fights, most wins and most finishes in UFC heavyweight history. 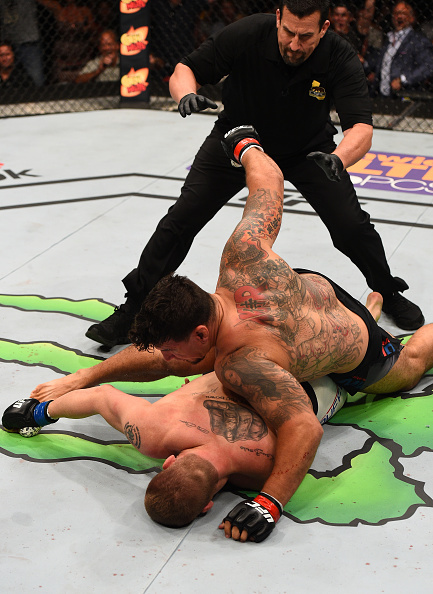 In many respects, Frank Mir is the epitome of the division he has held the title and the interim title of. Since UFC 34, the BJJ black belt from Las Vegas has been ending fights inside the Octagon any which way he can. With his fists, feet and knees, Mir has tallied another five finishes, including his back-to-back first-round knockouts of Todd Duffee and Antonio Silva just last year. But it’s Mir’s grappling skills the fans have come to know and love the most, with the chokes, holds, bars and locks which have earned him eight submission victories. And when it came to him cinching up something, it was tap or snap, as Mir eloquently demonstrated in his memorable armbar of Tim Sylvia to win the belt at UFC 48 and his rolling kimura of fellow heavyweight living legend Antonio Rodrigo Nogueira at UFC 140. Much like UFC Hall of Famer Chuck Liddell, people love watching Andrei Arlovski knock people out. With nine KOs and two submissions, “The Pit Bull” has always been a fast starter and a quick finisher inside the Octagon, including three stoppage victories in under a minute each. The former UFC heavyweight champion made his Octagon debut with a 55-second armbar in November 2000 and is still one of the top talents in the division to this day, having just had a seven-fight UFC win streak ended in a title eliminator in January. The Belarusian’s near mythic right hand is still taking out some of the best heavies the UFC has to offer, like Arlovski’s TKO of Travis Browne in their wild Fight of the Night at UFC 187.
parison, by scoring 11 finishes as a UFC welterweight. The Immortal has netted two submissions, like his most recent guillotine choke at UFC 189, but Brown’s amazing nine striking stoppages are a UFC welterweight record. Punches, kicks, knees, elbows, in the clinch and at distance, Brown smothers his opponents with offense and never stops until the ref pulls him off. Maybe the best example of this is Brown’s third-round TKO of Erick Silva in The Immortal’s home state of Ohio, which earned Fight of the Night and Performance of the Night honors. There will never be another Randy “The Natural” Couture. Across his 14 years in the sport, Couture won a UFC tournament, he won the UFC heavyweight title three times, successfully defended it three times and won the UFC light heavyweight belt two times. In total, The Natural claimed 16 wins inside the Octagon with 11 finishes - 7 KOs, 4 subs. The ageless wonder didn’t boast the biggest frame or the baddest one-punch KO power, but, all the same, Couture chewed up and spit out top tier opponents in two weight classes. 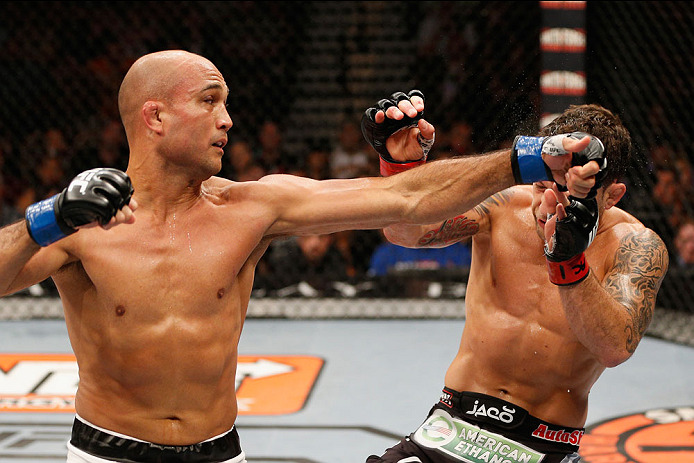 The Natural ground down opponents with top pressure and strikes, and Couture had sneaky good chokes as well. While he is just as revered for his wars that went to the scorecards, two of his greatest finishes were his TKO of Gabriel Gonzaga at UFC 74 and his TKO of rival Chuck Liddell at UFC 43. Be scared, homie. The fighter with the most submissions in Octagon history not named Royce Gracie was, of course, a star pupil of the family. 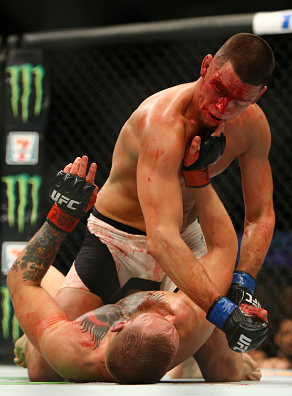 Whether he’s The Ultimate Fighter 5 winner and/or the famed “Stockton Slapper” to you, Nate Diaz is the owner of nine finishes of the tapping variety and two TKOs to boot. Not to mention, Diaz did run through the TUF house with three different chokes. The one-time UFC lightweight title challenger has pummeled opponents with his length and multitude of punches until they make the disastrous choice to go to the floor with the highly-regarded Cesar Gracie black belt. From his double-gun salute during his triangle choke of Kurt Pellegrino to his internet-breaking rear naked choke of current UFC featherweight champ Conor McGregor last weekend, Diaz wants to make his opponents quit to the delight of the crowd and without a word from the judges. This past December, Gabriel “Napao” Gonzaga actually won a UFC fight for the first time without a finish. No one was pleased by that strange occurrence, least of all the imposing Brazilian with seven KOs and four submissions inside the Octagon. Let’s just call it as it is, Gonzaga is a super-freak athlete. When he made his debut at UFC 56, Napao had been a highly thought of BJJ black belt for years who was transitioning into a different sport. Instead of an armbar or guillotine as a possible finish, Gonzaga closed out Kevin Jordan’s night with a stone-cold Superman punch KO. Less than two years later, Gonzaga would drop Mirko Cro Cop with a right head kick that was so devastating that the outreaches of the universe are still feeling the ripple effects. Gonzaga is a classic titan of the Octagon who can finish opponents with that one shot, which will forever keep the heavyweight division so fun. Across four nights and eleven taps, Royce Gracie made his family’s work a revolution throughout the martial arts world. Arguably, all it took was the one night at UFC 1, but the Gracie legacy was cemented because the undersized kid from Rio did that voodoo that he did so well each and every time for the first four UFC tournaments. 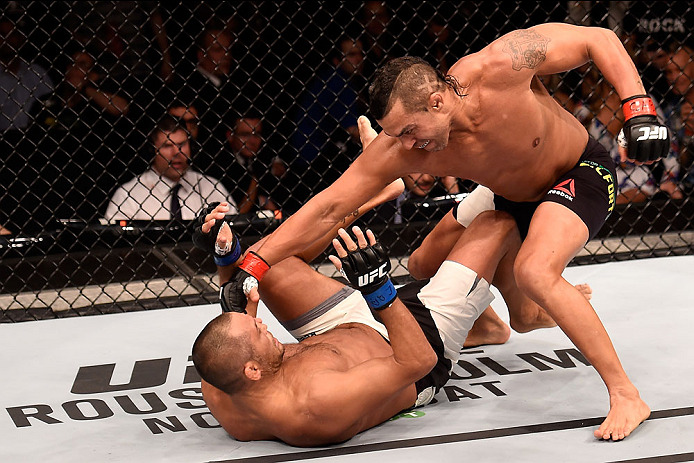 Eleven consecutive trips inside the Octagon yielded the same result, Gracie via submission. From his 57-second choke of eventual UFC Hall of Famer Ken Shamrock to his 15+ minute choke of another eventual UFC Hall of Famer, Dan Severn, Gracie defeated man after man, regardless of size or background, and each one of those submission victories changed how the world thought about fighting. The Octagon is forever linked with Gracie’s 11 consecutive finishes inside of it and, probably, no other fighter’s finishes in its history will ever equal what Gracie’s meant to it. The fifth season of The Ultimate Fighter was filled with killers. Tied with his castmate Diaz and with a similar stoppage distribution, Joe Lauzon owns eight submission wins and three KOs inside the Octagon. The pride of New England had one of the most auspicious debuts in Octagon history with his 48-second Knockout of the Night of former UFC lightweight champion Jens Pulver, which “J-Lau” has delivered on with nine and a half years as a relevant talent and eleven additional wins to his record. Actually, Lauzon’s 11 finishes are the most in the 155-pound division’s history, and his six Submission of the Night awards are the most in that bonus’ history. Fight fans have loved Lauzon throughout his UFC career, with his everyman’s personality mixed with his unending grit and his penchant for ending a tangle on his terms. At UFC 31, a 22-year-old Hawaiian with a near mythical back-story as a BJJ black belt world champion, made his pro MMA debut inside the Octagon with a first-round knockout. A month later, he scored another knockout in half the time with his knee. About five months after that, BJ Penn scored his third knockout - this time in 11 seconds. “The Prodigy” took the UFC by storm and has kept fight fans captivated ever since. In a time when Matt Hughes seemed unbeatable, Penn moved up in weight to face the then-UFC welterweight champion and submitted Hughes by rear naked choke in the first round. Years later, Penn would return to the UFC to compete at lightweight, where he would go on to become champion in a second division. With 12 wins in total inside the Octagon, The Prodigy has seven KOs and four submissions, and somehow each one was more impressive than the last. Honorable mentions with 10 finishes: Donald Cerrone, Kenny Florian, Rich Franklin, Anthony Johnson, Chuck Liddell and Tito Ortiz.